We're pleased today to grant you access to the Spring 2019 issue of Money Metals Insider – a FREE benefit for you, our valued reader. Please hit the download link and check it out right away! You'll learn what Warren Buffet just said about gold and why he's totally off his rocker. 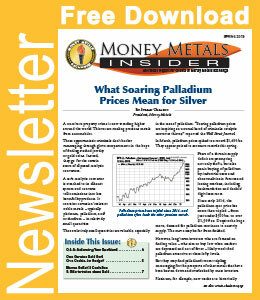 Your free Money Metals Insider newsletter also updates you on how the fireworks in the palladium market portend a big move in silver. Plus, we answer your questions about what's happening with premiums, the best ways to get silver and gold at barely over spot, and much more. Of course, not only does Money Metals offer super competitive pricing when you want to buy, but also we are without a doubt the #1 place in the country to SELL or STORE your precious metals as well. So download the PDF of this fantastic free newsletter right now – and pass it around to your friends! It's another free benefit for those who have signed up for the Money Metals email list.